The n orthern province of Quang Ninh has greeted nearly 7 million tourists since the start of the year, 94.3 percent of the year’s plan and a 9 percent increase over a year previous, according to the provincial Department of Culture, Sports and Tourism. Of this figure, foreign tourists arrivals reached more than 2.3 million, up 6 percent in comparison the same period last year, while more than 3.36 million tourists stayed overnight in Quang Ninh, up 16 percent year on year. The province’s tourism turnover over the past eleven months reached more than VND4.6 trillion, a year-on-year rise of 15 percent. In November alone, the number of tourists to the province reached 513,000, including more than 259,000 foreign arrivals. 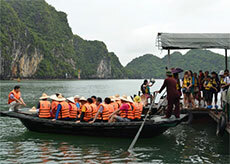 Total tourism turnover this month reached an estimated VND426 billion.